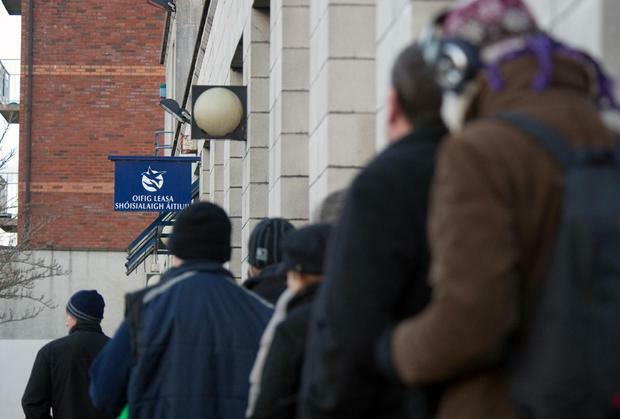 The unemployment rate is due to fall below 6pc by the end of this year, according to updated Government forecasts. The Department of Finance yesterday published the so-called Draft Stability Programme Update, outlining the Government's projections for the economy, which will be sent to Brussels for approval later in the month. The Government is expecting 55,000 jobs to be created, bringing the jobless rate to an average of 6.4pc for the year, but dropping below 6pc by year's end. The document stated the growth forecast for 2017 has been upgraded to 4.3pc and up to 3.7pc for 2018, as noted by Finance Minister Michael Noonan on Monday. Despite the threat of Brexit, the department expects the economy will grow on average by 3.5pc between 2018 and 2021, but warns the UK vote will still have an impact. It reiterates that 10 years after Brexit, growth is likely to be almost 4pc below what it would have been. Ian Talbot, chief executive of Chambers Ireland, said the improved GDP forecast and the positive employment growth predicted were further evidence that now was the time for Government to invest in capital infrastructure projects. "This investment will support future economic growth and help insulate the economy from any potential economic shocks that result from the UK withdrawal from the EU, as referenced in the Draft Stability Programme Update," he said. The Government document states that at the time of the budget, it was forecast that taxes totalling €50.6bn would be collected this year. That is unchanged. The debt ratio continues to decline, reaching 75.4pc of GDP last year and is forecast to continue on a downward trajectory next year. This is skewed, however, by the massive 26pc increase in GDP in 2015, caused by the accounting activities of multinationals. In nominal terms, the level of debt fell by half a million euro last year, but the debt pile still sits at more than €200bn. It will increase to €204bn by year's end.